Imagine yourself sitting comfortably in a traditional wooden sleigh being pulled slowly but steadily by a majestic reindeer through a peaceful Arctic landscape - hearing only the dampened sound of reindeer hoofs crunching in the soft snow below. 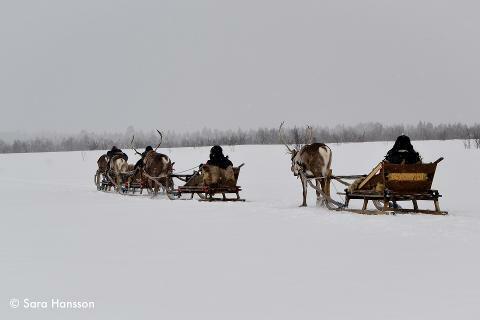 This exciting adventure is a sure-fire way to get a true taste of how the reindeer herders transported themselves and their belongings during the winter months for the last several centuries. Our exciting tour starts from your selected pickup point in Abisko or Björkliden and is then followed by a 45 minute ride to the Sámi village of Rávttas. During your time in our modern bus it is not uncommon to see beautiful wildlife along the route including reindeer, moose, Arctic hare, red foxes and birds of prey. 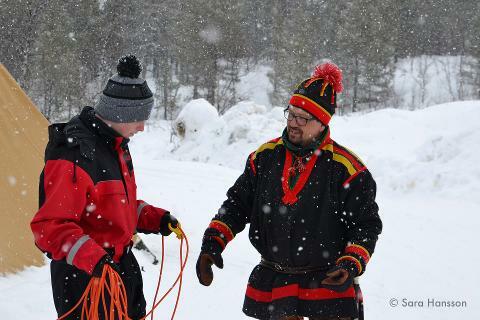 Upoon arrival in Rávttas you will be taken to the corral where your guide, an experienced Sami reindeer herder, will help you collect your soon-to-be companion on this great adventure. After meeting your new friend, you will receive instruction on how to harness your reindeer and most importantly, how to steer the sleigh once on your way! During the exciting hour-long sleigh ride you will have an opportunity to guide your reindeer through mesmerizing old-growth forest and across frozen moorland with the impressive Kiruna mountains rising as an unforgettable back drop that is sure to create memories that last a lifetime. Up to 2 people will be traveling in each sleigh - both with the opportunity to steer as you take turns holding the reins. 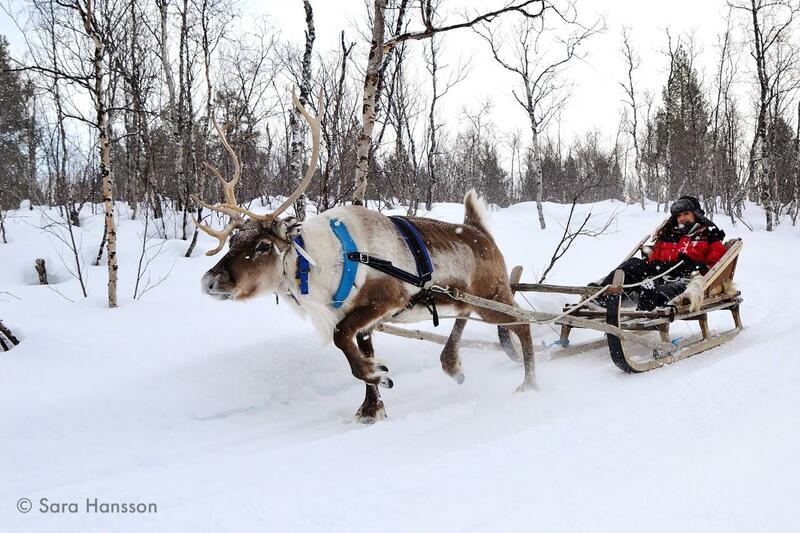 Different reindeer have different caracteristics and for the more adventurous there will normally be an opportunity to choose a stronger reindeer to pull their sled for a more lively (although shorter) ride. 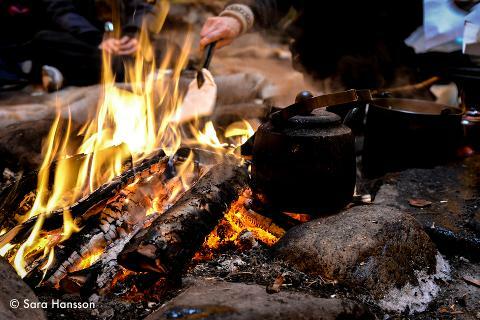 As you return to the camp you will be invited inside one of our warm and cosy traditional Sámi lavvus (teepee) where you will be served a freshly prepared, delicious meal around an open fire. This is also the time to ask your Sami guide questions about reindeer herding and their unique way of life in the Arctic. A maximum of 8 participants are allowed on this tour ensuring a personal and exclusive experience. 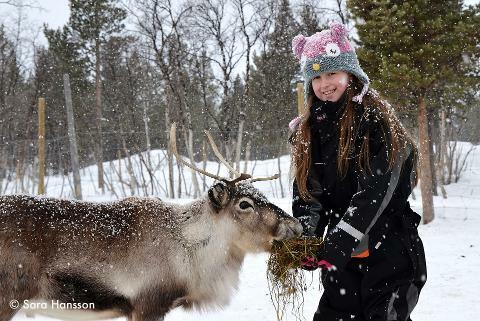 Let this once-in-a-lifetime adventure take you to the heart of Lapland. Book your space today! Not enough availability on the date you are interested in? This tour is a collaboration where we share availability with our partner and we may be able to open a few more spaces for you. Please send your request to info@visitabisko.com. 1. You can choose to receive a credit of 2695 SEK that can be applied to any of our activities or transfers. 2. You can choose to receive a full refund of 2695 SEK.